With a population of just under 200,000 Warrington is the largest town in Cheshire. Although the town dates back to Roman times, much of its development has taken place since its designation as a new town in 1968. Located at the intersection of the North West’s major motorways (M56, M6 and M62), the town is a major transport and distribution centre. Warrington has a good selection of hotels and accommodation options to suit all budgets and needs. The Village is a modern hotel close to Warrington town centre with extensive facilities such as a leisure club and pub. Other popular choices include Daresbury Park, and the Best Western Fir Grove Hotel. Warrington offers a good choice of things to do for visitors of all ages. Gulliver’s World is a theme park aimed at families with young children. Other attractions popular with kids are Apple Jacks Adventure Park and the Catalyst Science Discovery Centre. The LA Bowl is an entertainment centre at Winwick Quay featuring tenpin bowling, dodgems, and a laser tag arena. Nearby is the Warrington Odeon, a multiplex cinema with 10 screens. Warrington’s Cultural Quarter at Palmyra Square is home to Parr Hall and the Pyramid Arts Centre. Parr Hall is the main entertainment venue in the town and regularly plays host to some of the biggest acts in theatre, music and comedy. There are over 800 hectares of publicly owned parkland in Warrington. Public parks include Sankey Valley Park, Rixton Claypits Nature Reserve, Risley Moss Local Nature Reserve, Walton Hall and Gardens, and Victoria Park. Beautiful gardens can also be found at Norton Priory. Warrington is the venue for Creamfields; arguably the best dance music festival in the UK. The main shopping centre in Warrington town centre is Golden Square. Following a major redevelopment in 2007 it now houses more than 150 stores, including a flagship Debenhams department store. Another popular town centre retail destination is the Cockhedge Shopping Park. Shops here are a mix of independent traders and big high street names such as Argos, Asda, and Maplin. Warrington also boasts a great selection of out of town shopping parks. The best known is the Gemini Retail Park, home of the first IKEA in the UK and one of the largest Marks and Spencer’s stores in the country. Other retail parks in the area include Alban Retail Park and Riverside Retail Park. 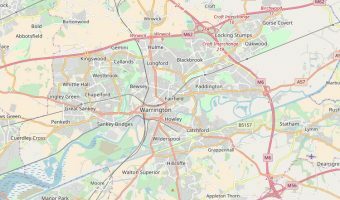 Warrington is easily reached from the M6, M56 or M62 motorways. The town is just 15 miles from Manchester Airport and 18 miles from Liverpool John Lennon Airport. Warrington has two train stations, Bank Quay and Warrington Central. Both are in the town centre. Bank Quay is on the West Coast Main Line, serving intercity destinations such as London, Birmingham and Glasgow. Trains to Liverpool and Manchester depart from Warrington Central.